WordPress is arguably the most significant and favorite CMS platform users can choose. Because of the high demand and so many people who are using the platform, themes have become such an important part of the whole process. The themes are easy to be managed, do not require a special computer degree and can be adjusted without a hassle. There are different websites that can be created with WordPress including blog, corporate and personal. Most of those themes are actually paid and find a free one is not always simple and easy. That is why a free blank theme is preferred by a lot of website developers. These types of themes (also called “starter themes” and even “naked themes”) are the starting point that you need to begin creating your own, personal website. Imagine a blank sheet of paper that you want to start drawing on. 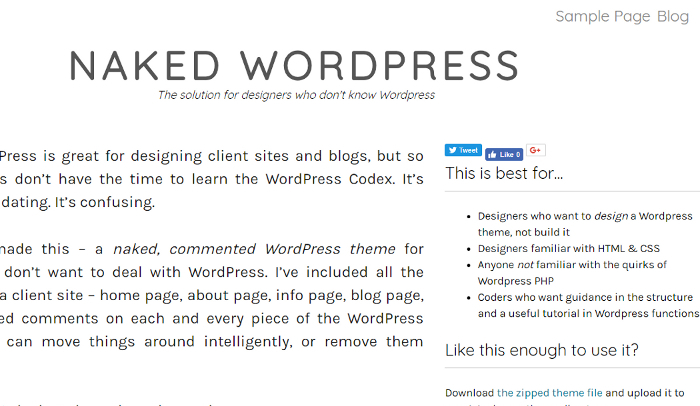 Most files on a blank WordPress theme can be modified and even though the name includes the word “blank” they come with basic WordPress PHP, CSS and HTML codes. The main reason why you would choose to start creating your website with a blank theme is that it can actually be faster for you. It reduces the number of codes you need to write you do not need to write the same code over and over again every time a new theme is created. 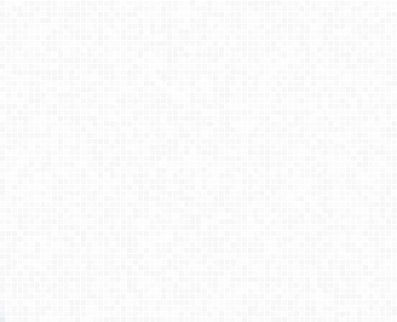 Starting with a link to probably the simplest blank theme you can find. It is absolutely free and it is an open source as well. As it has not visual CSS styles added you will be forced to create your own creative design. This is another great blank theme for users who want to be in control of the creative process. This one contains all the basic needs for every developer – you will find a home page, about page, info page. It allows you to learn the whole process when you create your own website – walks you through the steps and you have no choice but to get more familiar with it. 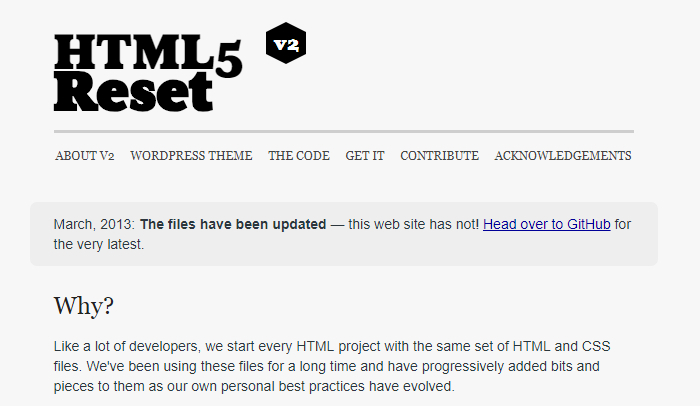 As the name suggests this one has been created on the HTML5 Boilerplate platform (created by Paul Irish and Divya Manian), while the layout was based on Bruce Lawson’s Designing a Blog with HTML5. 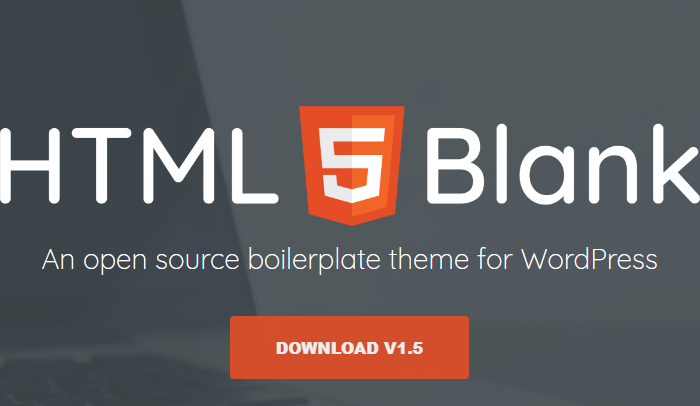 It is an open source project and it has a simple purpose – saving the time of the developer when applying the HTML5 Boilerplate to WordPress. 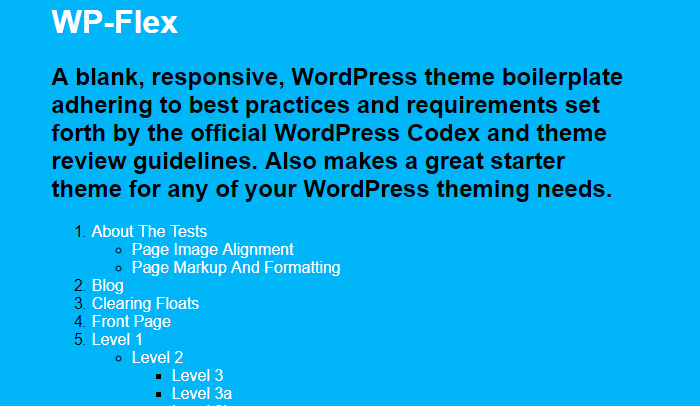 The WP Flex theme contains more firepower than expected. It is a responsive blank theme but it also has serious guns underneath the “blank white paper sheet”. It has strict compliance with the official WordPress theme guidelines and a simple data for user tasting. JointsWP will give you all the needed tools for you to build a complex and solid website without really starting from scratch as it has been built on top of Foundation 5. You have the option to choose between Sass (variables, mixins, nesting) and the full version of CSS. The JointsWP blank theme is the starting point that you need to begin the website creation but it is not the final product. You can choose this great option to initiate your website as well. It contains a simple and easy to work with set that gives you all the needed information and tools. It has some amazing features that will give you more authenticity with your website. It is easily adjustable as you can remove pretty much everything that you do not need or want on your worksheet. Simple CSS targeting and meta tags ready to be explored. It is very user friendly for Apple fans and social media followers as well – meta tags can be used with Facebook and Twitter, while your iPhone/iPad/iTouch would have icon snippets. You can also start the development on an absolutely blank sheet by removing all the existing styles in each browser. Bones is not only a great name for a blank theme but it is a great blank theme as a whole. You can strip down the unnecessary information and styles and you can build your own as you wish. 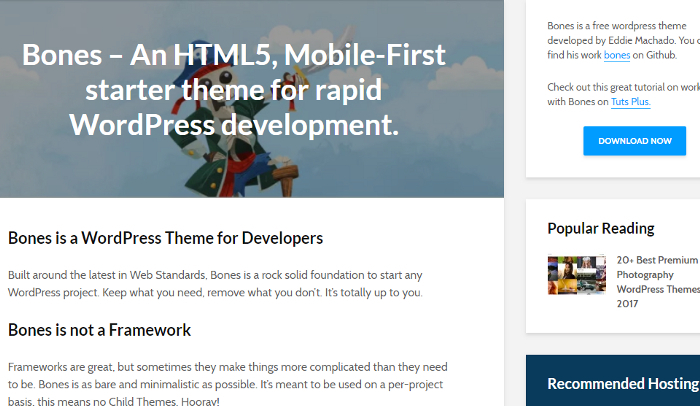 A rock solid foundation is the core of this theme and it is there to support your project. If you are looking for a framework – this is not one and that is not a bad thing in some cases. Frameworks are usually great but sometimes they can create a mess. Bones is simpler and it does not have any Child themes. As all the other themes here Bones is free as well. 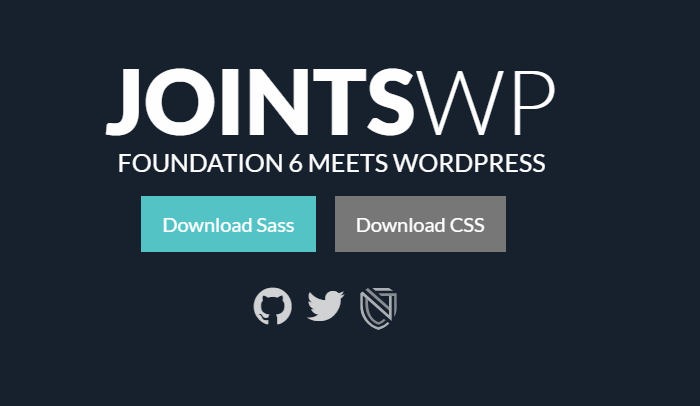 It has been loaded with CSS and by using wise Sass you will get a faster result. 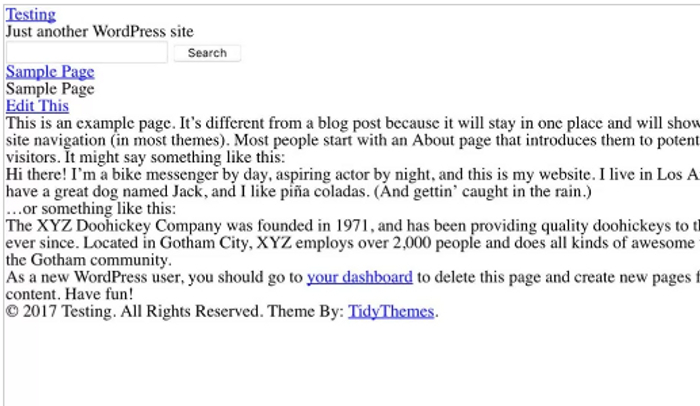 The blank WordPress theme will give you the needed examples and comments.